The lineup has been set for this year's Bonnaroo Music & Arts Festival. The festival, set for June 7 to 10 in Manchester, TN, has definitely moved from its original jam band roots to an all encompassing program with artists from Americana to Hip Hop. 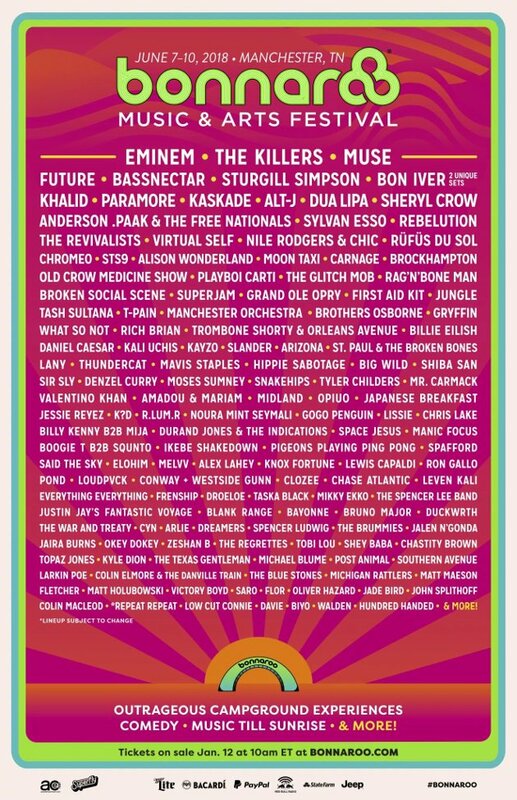 While a specific schedule has not been announced, Eminem, Muse and The Killers are listed on the festival line-up poster as the headliners followed by Future, Bassnecter, Sturgill Simpson, Bon Iver, Khalid, Paramour, Kaskade, Alt-J, Dua Lipa and Sheryl Crow. Other veteran artists on the bill include Nile Rodgers & Chic, who seem to be doing the festival circuit this year, Old Crow Medicine Show, who also played the first Bonnaroo Festival in 2002, and Mavis Staples.